Thursday night, the Nashville Predators celebrated their first victory at home since they defeated the Tampa Lightning on February 27th. In the victory, every Predators forward registered at least one point, including Patric Hornqvist. For Hornqvist, it was important to get the win in front of the home fans. The win came against the Buffalo Sabres, the worst team in the National Hockey League, but as a true professional, Hornqvist knows that you can’t overlook any team. One of the young players stepping up has been Calle Jarkrok. In four games with Nashville, Jarnkrok has registered four points. Thursday night, Jarnkrok recorded his first NHL goal and he’s definitely been impressing the team with his hard work. It had been quite some time since the Predators converted on the power play, which seemed to be struggling ever since David Legwand was traded to the Detroit Red Wings. Against the Sabres though, Nashville was able to utilize their not-so-secret weapon: Shea Weber. Hornqvist understands that it’s been a season full of some ups and downs, but there are still some positives that can be taken away from the 2013-2014 season. 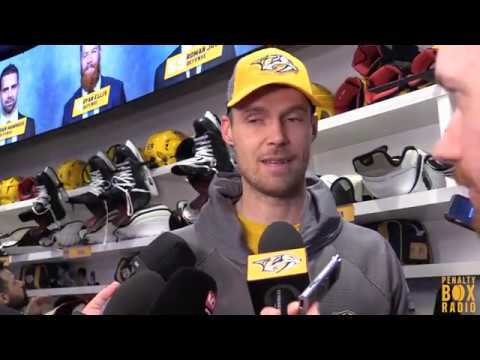 Building off of the surge from the young forwards, Hornqvist knows that if they continue their strong play, Nashville can finish the season on a high note. If anything, they can build confidence going into the next season by stringing together a few wins. With Patric Hornqvist, he’s another player that leads by example on the ice and in the locker room. Knowing the team’s strengths and weaknesses as well as complimenting those that are performing well are the true sign of a leader. It surely shows why he’s been deserving of wearing the “A” this season as an alternate captain.